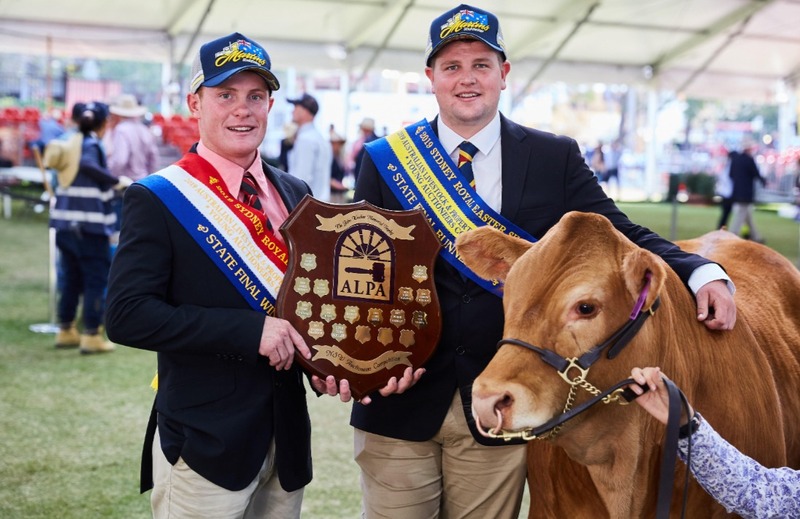 From left, 2019 ALPA National Young Auctioneers Competition winner, Anthony O’Dwyer, GDL Dalby, and runner-up, Joe Allen, Elders Euroa. 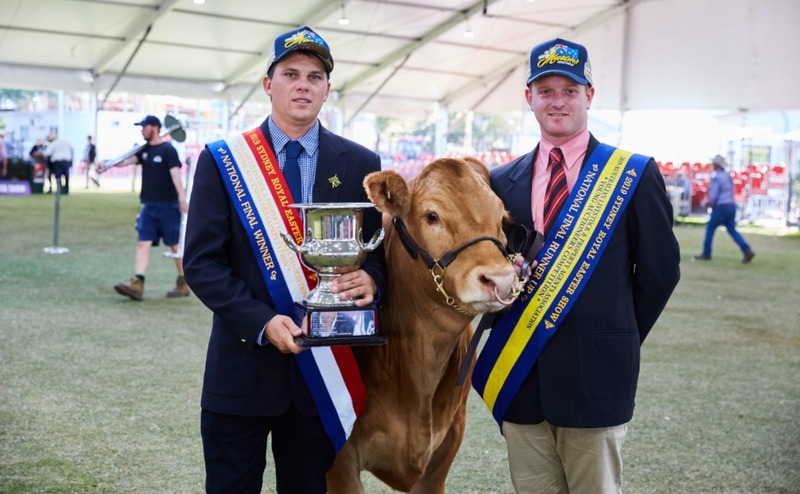 QUEENSLAND stock agent Anthony O’Dwyer has won the 2019 ALPA National Young Auctioneers Competition at his first attempt as the state’s representative at the Sydney Royal Easter Show. Anthony, 25, has only previously competed at state level and been selling fat and store cattle at Dalby’s weekly Wednesday cattle sale for the past six years. “It was a real eye-opener, I really enjoyed it,” he said of the national competition run the Australian Livestock & Property Agents Association at the Sydney show last Friday. Anthony hails from Roadvale in Queensland where the family runs a small property. He will now go on to represent Australia in the International Livestock Auctioneers Competition at the Calgary Stampede, Canada. Anthony also took home the Prosser Cup and several other prizes. Euroa Elders agent Joe Allen was the 2019 ALPA National Young Auctioneers Competition runner- up and will go to New Zealand to sell. Each year the NAB Agribusiness Team Shield is awarded to the state with the highest combined score. This year Queensland, represented by Anthony, and Jack Henshaw of Elders in Goondiwindi, won the team shield. Young stock and station agents from across the country showcased their auctioneering skills at the 2019 ALPA New South Wales and National Young Auctioneers Competitions at the show. The events marked 29 years of the ALPA National Young Auctioneers Competition and 31 years of the ALPA NSW Young Auctioneers Competition. The 10 NSW competitors and seven national competitors each sold three lots. The competitors were judged on their diction, values, voice and manner, as well as their presence and unique style, by a panel of respected and experienced auctioneers. From left, 2019 ALPA NSW Young Auctioneers Competition winner, Angus MacTavish, Elders Walcha, and runner-up Cooper Byrnes, Langlands Hanlon, Parkes. Walcha Elders agent Angus MacTavish of Elders in Walcha was declared the 2019 ALPA NSW Young Auctioneers Competition winner, earning himself the John Weekes Memorial Shield and a place in the 2020 ALPA National Young Auctioneers Competition. Coming in second was Cooper Byrnes of Langlands Hanlon in Parkes. Cooper will also represent New South Wales in the 2020 ALPA National Young Auctioneers Competition. The Max Bailey Encouragement Award went to Ben McMahon of Lehman Stock & Property in Inverell. ALPA chief executive officer Andy Madigan said the national competition brings together the best young auctioneers from across the country; the competition is always exciting to watch. The night before the competitions more than 270 ALPA members, industry professionals and the competitor’s friends and families gathered at the annual ALPA NSW and National Young Auctioneers Competitions dinner to celebrate the talent and achievements of the young auctioneers. A highlight of the night was the charity auction, conducted by Samuel Gemmell (2018 ALPA National Young Auctioneers Competition winner) and Ben McKerchar (2018 New Zealand Young Auctioneers Competition winner) that raised more than $22,000. The funds will be donated to the Royal Flying Doctor Service, a not- for- profit charity that offers excellence in aeromedical and primary health care across Australia.